← Is There Something Wrong with the Official Boston Bombings Story? Apparently there’s no resisting the allure of native advertising these days. The latest converts to ads in sheep’s clothing? USA Today and the Wall Street Journal. The latter’s surrender is the more interesting of the two, given the low opinion of native ads previously expressed by the paper’s top editor. For those unfamiliar with German folklore, that’s a deal with the devil. Sponsored content, native advertising, ads that are annoyingly similar to editorial content — whatever you want to call them, they’re coming to The Wall Street Journal. 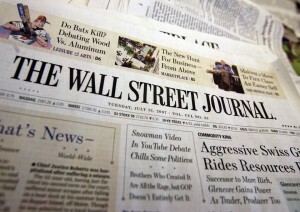 The paper has announced that WSJ Custom Studios will create the ads labeled as “Sponsor Generated Content,” and they’ll be embedded among other editorial content. The first native ads, from Brocade, will debut tomorrow. Each ad will be created by staffers hired specifically for WSJ Custom Studios. No Journal staffer will be involved in the ads. And – no surprise here – editor Baker’s estimation of native advertising is now decidedly more positive. FishbowlNY’s report includes this statement from Baker . . . This entry was posted in Uncategorized and tagged Advertising Age, Chartbeat, Chris O'Shea, Faustian Pact, FishbowlNY, MediaBistro, Michael Sebastian, native advertising, Peter Kafka, Re/code, Sneak ADtack, Sponsor Generated Content, Wall Street Journal, WSJ Custom Studios, WSJ.. Bookmark the permalink. Yeah – imagine the WSJ doing a deal with the devil. Actually, the WSJ was one of the last holdouts. The Times, the Washington Post – they were already turned.